Amartya Sen, The Idea of Justice, Harvard University Press, 2009. The most important contribution to the subject since John Rawls’ A Theory of Justice. Sen argues that what we urgently need in our troubled world is not a theory of an ideally just state, but a theory that can yield judgments as to comparative justice, judgments that tell us when and why we are moving closer to or farther away from realizing justice in the present globalized world. In lucid and vigorous prose, The Idea of Justice gives us a political philosophy that is dedicated to the reduction of injustice on Earth rather than to the creation of ideally just castles in the air. Amartya Sen brings political philosophy face to face with human aspiration and human deprivation in the real world, to whose improvement he has devoted his intellectual life. A major critical analysis and synthesis. Sen’s inclusive approach transcends the many important scholars and viewpoints that he analyzes. 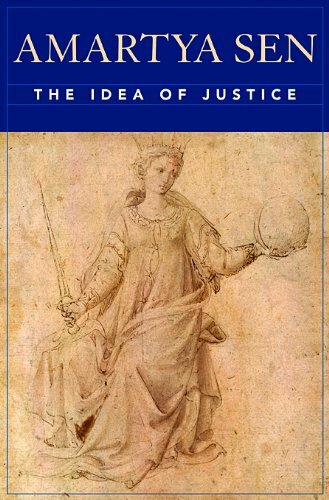 The Idea of Justice presents a set of considerations on justice of importance to both the academic community and to the world of policy formation. In the courtliest of tones, Mr. Sen charges John Rawls, an American philosopher who died in 2002, with sending political thinkers up a tortuous blind alley. The Rawlsian project of trying to describe ideally just institutions is a distracting and ultimately fruitless way to think about social injustice, Mr. Sen complains. Such a spirited attack against possibly the most influential English-speaking political philosopher of the past 100 years will alone excite attention. The Idea of Justice serves also as a commanding summation of Mr. Sen’s own work on economic reasoning and on the elements and measurement of human well-being…Mr. Sen writes with dry wit, a feel for history and a relaxed cosmopolitanism…The Idea of Justice is a feast…Nobody can reasonably complain any longer that they do not see how the parts of Mr. Sen’s grand enterprise fit together…Mr. Sen ends, suitably, with democracy. It can take many institutional forms, he says. But none succeeds without open debate about values and principles. To that vital element in public reason, as he calls it, The Idea of Justice is a contribution of the highest rank. At the heart of Sen’s argument is a respect for reasoned differences in our understanding of what a “just society” really is. People of different persuasions—for example, utilitarians, economic egalitarians, labor right theorists, no­-nonsense libertarians—might each reasonably see a clear and straightforward resolution to questions of justice; and yet, these clear and straightforward resolutions would be completely different. In light of this, Sen argues for a comparative perspective on justice that can guide us in the choice between alternatives that we inevitably face. Amartya Sen, winner of the 1998 Nobel Prize in Economics, is Lamont University Professor, Harvard University.